The bunk bed arrived this past weekend. Lucas and Stella now officially share a room. This is good. I’m already seeing their relationship blossom. 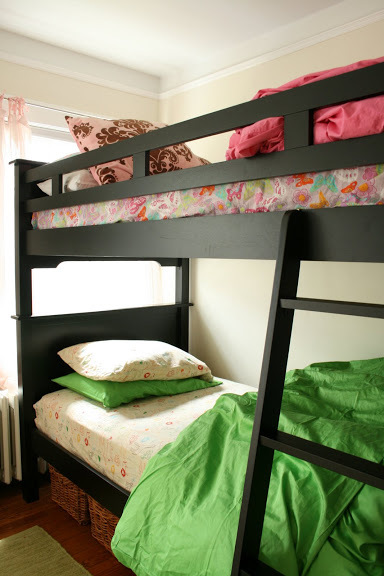 I choose a black bunk bed because it will eventually be the beds for Lucas and Jackson. In the meantime, we decided to keep the nursery as the nursery. And I’ve been changing Stella’s pink bedroom to a more boy-friendly room. I still need to take down her pink curtains and pink chandelier. Love the bunk beds! I keep thinking we need to change up our kiddo room — bunk beds would save a ton of space. I love the idea of baskets under the bed…I may have to add this. That’s a cute arrangement for them. They’re growing up too fast! Seth and Eric had bunk beds for many years. They seemed to enjoy the companionship. I LOVE IT! We are in the market now for a bunk bed for the boys when we move into our new home. Where did you get this bed? I love how you chose black too! I bought it off ebay! I like the color of this bunk bed. Is it Espresso?